Joe Biden has a bad past in all sorts of ways. Here's another one: he spent his career helping build the very deportation state now in Trump’s hands. It looks like Joe Biden is running. With Beltway insiders and Democratic bigwigs talking up his presidential chances, the former vice-president looks to be the candidate to beat in the 2020 primaries. The only problem is, it’s Joe Biden. If you thought Hillary Clinton was a weak candidate, with her transactional style and triangulating policy stances, then you probably won’t be excited by Biden’s multi-decade history in the Senate. 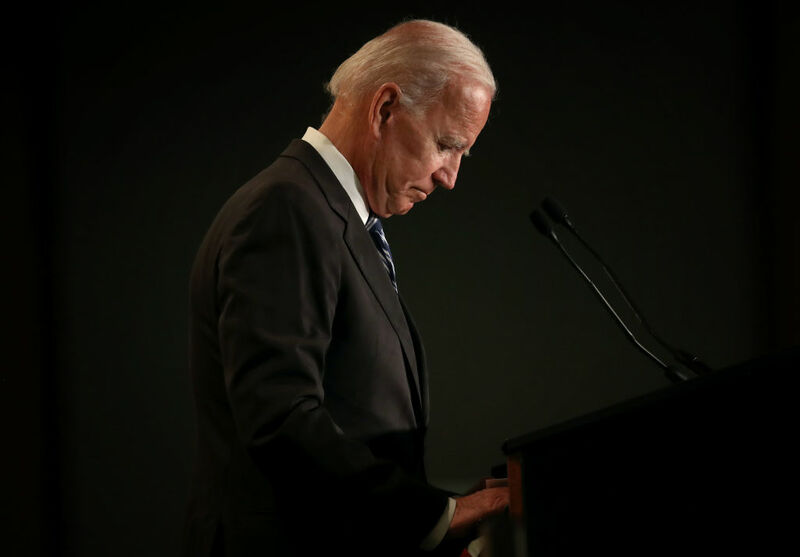 Apart from Clinton’s inept campaigning and inability to connect with voters, Biden shares many of the same red flags that led a large share of the Democratic base to look with suspicion on the former secretary of state. In this series, Jacobin’s Branko Marcetic takes a look back at the career of Delaware’s longtime senior senator. Below is Part VI: Joe Biden, Anti-Immigrant Enabler. The Democratic Party of today is a different beast from the one under Obama. While the last Democratic president did everything he could to triangulate on immigration, from deporting record numbers of people to militarizing the border, electoral considerations, the rise of Donald Trump, and an increasingly powerful activist movement have led the party to place immigrants’ rights at the center of their political vision. Being “soft” on immigration is no longer a liability for a Democrat, but being “tough” on the issue may well be. Which is why Joe Biden may well find it difficult to find favor among Democrats once he launches his campaign. Biden doesn’t have a uniformly harsh record on immigration issues. Rather, his forty-year-long political career has seen him shift wildly with the times, extending an outstretched hand to immigrants one moment and closing his fist the next. As with many issues, in times of pressure or right-wing ascendence, Biden has opted to make common cause with conservative efforts to stoke fears around immigration and seek continuity instead of a break with consensus — an approach that now puts him out of step with not just the Democratic Party, but, increasingly, the US public, too. There are certainly parts of Biden’s history that put him in line with today’s more immigrant-friendly Democratic Party. In 1983, Biden voted to defeat an amendment put forward by Jesse Helms, which would have allowed states to defy the Supreme Court and deny benefits like free public education to undocumented immigrants. Three years later, he voted for Ronald Reagan’s “amnesty” bill that gave millions of undocumented people the right to live in the US and get legal residency. Another three years after that, he voted for Ted Kennedy’s Immigration Act of 1990, which restructured US immigration law into a more skills-based system, and an amendment to halt deportations for family members of those allowed to stay under Reagan’s amnesty law. He also voted against giving preference to English-speaking immigrants, and to allow the Census to keep counting undocumented residents to apportion House seats. The year 1989 also saw Biden vote for and approve ultimately unsuccessful bills that allowed Chinese students to stay and seek US residency in the midst of China’s anti-democratic crackdown, and that suspended the deportation of undocumented Salvadorans and Nicaraguans. The former was vetoed by Bush, while the latter was stalled to death by Wyoming Republican Alan Simpson, an immigration hawk best known today for being tasked by Obama to slash entitlements in the early 2010s. But Americans’ relaxed attitude to immigration began to change in the 1990s. By 1992, wrote Dittgen, it “had become one of the most contentious political issues.” In 1995, 48 percent of Americans told a Scripps Howard News Service poll they believed most immigrants in the US had come illegally, and the share of the public believing that immigration should be decreased hit an all-time high of 65 percent. A year later, the Democratic Party platform reflected a harsher focus on undocumented immigration that fit with its more punitive approach to the country’s problems more generally. Biden took some important steps that ran counter to that decade’s prevailing mood. The 1994 crime bill he helped design was mostly an abomination, but tucked away within the Violence Against Women Act — one of Biden’s signature legislative achievements, whose overall emphasis on punitive criminal justice measures was misguided and ineffectual — was the Battered Women Immigrant Provision, which allowed undocumented women physically abused by their partners to petition for legal status themselves. Previously, they were only able to do so through a husband who had legal status, putting untold numbers of women at the mercy of their abusers. Biden and Simpson crossed paths again two years later, when Biden repeatedly helped scuttle Simpson’s attempts to radically curb immigration, something the soon-to-retire senator viewed as the swan song to his political career. In March, Biden voted with eleven others on the Senate Judiciary Committee to split up Simpson’s immigration reform bill, one of the most restrictive in US history. The vote would allow the Senate to tackle undocumented immigration (more on that later) without having to wrestle with its provisions on legal immigrants; the latter, among other things, drastically slashed family immigration. The split was, partly, a result of pressure from the business community. Biden later voted on the committee in April to again stifle Simpson’s attempt to sharply cut family immigration, and joined an overwhelming Senate majority to reject an attempt to cut it by 10 percent. He later voted for an amendment to Clinton’s welfare reform bill that allowed disabled or needy documented kids to get government assistance. Ten years later, George W. Bush would attempt his own version of immigration reform. Biden voted for the Senate version, which created a guest worker program for some undocumented immigrants while giving others a (fairly onerous) path to legal status and citizenship, and boosting border security. The bill ultimately failed, with the Senate unable to agree a reconciled version with its far stricter House counterpart. That year, Biden also voted against legislation creating hundreds of new investigators to look into immigration law violations and reforming the green card lottery to make a two-tiered system for “skilled” and “unskilled” immigrants. So Biden has plenty in his record he’ll be able to point to to convince Democratic voters and a mobilized activist base that he’s the man to lead a break from Trump’s immigration policies. But this isn’t the whole story. There were many reasons for the rightward shift on immigration policy from the 1980s to the 1990s. One was the system of mass incarceration Biden himself had taken a leading role in erecting. Throughout the 1980s and 1990s, officials complained to Congress about overcrowding in prisons, with prisoners being placed in trailers, tents, gyms, and laundry rooms. These bulging prison walls were a direct result of policies like mandatory minimums, longer sentencing, and the elimination of parole — policies all successfully championed by Biden as part of the “wars” on drugs and crime. The concern was often paired with that decade’s fear over government spending, another issue fanned by Biden from the Reagan era onwards. In other words, while voting largely on the side of immigrants throughout the 1980s, Biden’s tough-on-crime approach had produced the very conditions that set the stage for a crackdown on immigration the following decade. Another faactor was a riptide of anti-immigrant public sentiment that carried away the Democratic Party, to the point where future Senate Majority Leader Harry Reid actually proposed a bill to end birthright citizenship. As the Democrats found themselves carried to unfamiliar waters, Biden went with them. Bill Clinton took office in 1993 after a campaign in which he had slammed George H. W. Bush’s repatriation and detention of tens of thousands of coup-fleeing Haitian refugees as “cruel,” “illegal,” and “immoral.” Clinton almost immediately abandoned his campaign promise to change the situation, but he did remain intent on carrying through another pledge: to repeal the five-year-old travel ban on HIV-infected immigrants, which was keeping three hundred “bona fide” Haitian refugees imprisoned in a quarantine camp in Guantanamo Bay. Instead of voting to end the Reagan-era ban and aid a newly elected Democratic president in fulfilling a campaign pledge, Biden helped hand Clinton an early political defeat just a month into his presidency. Biden voted to keep the ban, which would stay in place for another seventeen years. This was the start of a pattern throughout the 1990s that saw Biden go along with his party’s newfound hostility to migrants. That same year, Clinton nominated Janet Reno to serve as his attorney general, a tough-on-crime prosecutor who quickly set the tone for the administration. Biden was one of Reno’s fiercest champions, chiefly because of her “tough approach to fighting crime” and trigger-happy attitude to the death penalty. Biden’s 1995 vote for Bob Dole’s Antiterrorism and Effective Death Penalty Act (AEDPA) wasn’t just a broadside against constitutional rights like habeas corpus; it was also one of the principal pieces of restrictionist immigration law whose repeal has, in recent years, become a top goal of activists and critics. Among other things, the law for the first time put into action now-commonplace fast-track deportations and mandatory detention of immigrants convicted of even minor drug crimes, and it expanded the use of indefinite detention for some noncitizens. A spokesperson for the American Immigration Lawyers Association charged it would let the government “deport the mothers and fathers of innocent kids.” Immigration attorney Dan P. Danilov complained to Northwest Asian Weekly that it let the government use secret evidence to deport alleged terrorists, and that its elimination of judges’ discretion in cases of felonies or crimes of “moral turpitude” meant legal residents with partners and kids could be deported just for writing a bad check. “We’ve never had any law like this in the United States,” Danilov told the paper. Biden had proposed an amendment to remove the anti-immigration provisions of the bill. But after it failed, he voted for it anyway. (Bernie Sanders, now Biden’s chief rival for the Democratic candidacy, voted against the House version). Perhaps the most consequential votes Biden made on immigration policy came in 1996, however. A year earlier, he had joined the rest of the Senate in a near-unanimous vote to advance the Immigration Control and Financial Responsibility Act (ICFRA). This was the bill Biden had split up in order to focus on undocumented immigration. ICFRA beefed up the number of investigators and more than doubled the number of border patrol agents, required the development of a system to verify employment eligibility, and sought to deny welfare and other benefits to the undocumented. The Congressional Record shows Biden voting to keep a requirement for a new employment verification system in place, as well as a costly requirement for anyone benefiting from entitlements to obtain a new copy of their birth certificate. He also voted against giving even documented immigrants access to Medicaid. (Sanders, again, voted against this bill in the House). ICFRA was one of the bills that eventually became the Immigration Reform and Immigrant Responsibility Act of 1996 (IIRIRA), which ultimately helped lay the foundation for today’s sprawling deportation machine. Among other things, IIRIRA made it harder for undocumented immigrants to get legal status, broadened the crimes for which even legal residents could be deported, and made deportations easier. It authorized hundreds of millions of dollars to states for “alien incarceration” and expanded the use of Prisoner Transfer Treaties to send jailed immigrants to serve out their time in their home countries. IIRIRA also established the idea of “criminal alienhood,” previously a nonexistent concept, and created what one scholar has called a “hierarchy of mixed-citizenship families” that made it harder for poorer, less white, and less educated immigrants to reunite with their families. It introduced a one-year deadline on asylum, sharply curtailing such claims, and established the now widely used practice of deputizing local police as ICE agents. IIRIRA was eventually rolled into an appropriations bill that Biden initially voted against. But when it came to the crunch a few months later, the bill got his vote, and Clinton promptly signed it the day it passed. (By contrast, Sanders voted against that bill several times, and against an amendment that never made it to the Senate denying free public education to newly enrolled undocumented kids). Together with AEDPA, the passage of IIRIRA led the number of immigrants in detention to nearly double to 16,000 by 1998. Between 1994 and 2009, the capacity of immigrant detention centers quintupled to 33,400, even as the rate of undocumented immigration barely changed. Only three years later, immigrant rights advocates and the ACLU launchd a “Fix 96” campaign to change some of its most controversial elements, while Lamar Smith himself sent the attorney general a letter calling for discretion to reduce the deportation of legal residents whose kids were US citizens. IIRIRA has remained controversial; on the law’s twentieth anniversary, Arizona Rep. Raul Grijalva put forward a resolution signed onto by thirty-two other Democrats calling for repealing many of its provisions. Sometimes bills unrelated to immigration that Biden championed or voted for had ramifications for the issue. Besides establishing the crack/powder-cocaine sentencing disparity, the 1986 Anti-Drug Abuse Act that Biden led and later repented for expanded the ability to deport immigrants with drug offenses and set up pilot programs for cooperation between federal immigration authorities and state and local law enforcement. Likewise, the infamous crime bill that Biden designed and shepherded to passage created new crimes around immigration law, established a “criminal alien tracking center,” set aside $160 million for new “criminal alien detention and processing centers,” and put $675 million toward increasing border patrol personnel by a thousand a year over three years, among other things. The story was similar with Biden’s vote for another signature piece of Clintonite legislation seemingly unconnected to immigration: welfare reform. In the process of ending “welfare as we know it,” the bill also made many immigrants who weren’t legal permanent residents for five years ineligible to receive welfare, the source of much of its cost savings (veterans, refugees, and children were exempt). Together with IIRIRA’s restrictions, financial assistance to legal immigrant families dropped 60 percent. (While Sanders ultimately voted for the crime bill, he voted against welfare reform in the House). As the Senate debated the the 2006 immigration reform bill a decade later, Biden voted on proposed amendments in ways that would both please and displease immigrant rights advocates today. He voted against making English the official language, and he voted to give states grants for providing noncitizens with health care and education, for instance. At the same time, he also voted to increase fencing and improve vehicle barriers along the southwest border, to bar immigrants who had their statuses adjusted from accessing Social Security based on work they did when they were undocumented (which passed by one vote), against enhancing labor protection enforcements for both US workers and guest workers, and he voted to declare English “the common and unifying language of the United States, and to preserve and enhance” its role. It also remains to be seen how Biden will navigate his years as vice president to Obama, whose immigration policies were little different from the president now viewed as toxic by Democratic voters, and who in fact deported people at a higher rate. If Biden runs claiming Obama’s legacy, he will also have to claim Obama’s immigration policies. This will be all the more difficult as Biden sometimes took a direct role on this issue. As large numbers of children fleeing violence in Central America wound up in border states in 2014, Biden flew to Guatemala to meet with officials from several countries in the region to urge them to discourage their attempts to escape. While saying it was “clear we have to deal with the root causes,” Biden pledged more money for the Central American Regional Security Initiative, a program that funneled money toward the region’s corrupt and abusive security forces whose results were questionable at best. Biden acknowledged that violence in “our most dangerous places” was “a major reason” for the exodus of children. Yet he also boasted of “enhancing the enforcement and removal proceedings,” something he painted one minute as almost a humanitarian measure to reunite families, and the next minute something for those making the trip to “be aware of what awaits them.” “It will not be open arms,” he said. Indeed, according to a 2014 lawsuit filed by the ACLU, migrant children were deprived of medical treatment, shackled, sexually abused, and forced to drink toilet water by border agents. It was Biden who spearheaded the administration’s response to the crisis, the Alliance for Prosperity, a plan that promised financial incentives to Central American states in return for stepping up deportations and border militarization, which it also funded. Those incentives included pushing for privatization, free trade zones with special regulatory carve-outs for foreign investors, and the creation of logistics corridors for the movement of goods and new infrastructure, such as a new gas pipeline that opened up new markets for US gas exporters. Ironically, these policies were set to perpetuate the very economic and environmental conditions that saw migrants flee the region and peasants, indigenous people, and activists like Berta Cáceres protest and, sometimes, die over. While the vast majority of the investment would come from home countries, the US was on the hook for $1 billion per year over five years. Though the amount of aid fell far short of this, it became known as “Biden’s billion,” with the former vice president making a public push for the scheme that would hand $100 million more to abusive security forces that members of Congress were, at that very time, busy calling for a complete cut-off of aid to. There was a reason Obama chose Biden to lead the plan: it was modeled on the Clinton-era Plan Colombia, of which Biden called himself “one of the architects.” Biden urged Congress to approve the plan after personally visiting Colombia in 2000, initially viewing it as a way to internationalize the “war on drugs” he had helped birth in the 1980s. In practice, the scheme had done more to open the country up to foreign investment than to stem the flow of drugs. At the same time, the increased investment in security forces that came attached to US funding fueled breathtaking state violence in the country — 1.8 million displaced in three years and 3,000 innocent people killed, dressed up as guerrillas to claim reward money — while its anti-coca fumigation program destroyed only food crops, paradoxically feeding the growth of cocaine cultivation. Biden viewed all of these plans as successes, even as they fed into a vicious cycle by helping foster the very violence and deprivation that would push ever larger numbers of migrants out, in turn necessitating the plans’ revival. In a June 2018 op-ed, he name-checked both Plan Colombia and the Alliance for Prosperity as models for US policy to deal with the migration crisis going forward. A few months later a thousands-strong caravan of Central American migrants would dominate headlines, driven from their homes thanks in part to that same plan pushed by Biden while vice president. If Biden plans to win the 2020 election by siphoning off Trump voters through triangulation on immigration, he’ll have a strong case to make. Throughout the 1990s, he repeatedly helped pass legislation that weakened the rights of immigrants, both legal and undocumented, while giving increased power and resources to authorities for finding and deporting undocumented people. And as vice president, he championed policies that funded border militarization and deportation as a response to a growing migration crisis. But this history may well prove a liability as Biden fights for the approval of a Democratic base that has turned against such policies, and within which immigrant rights activists have taken a more leading role. As with his record on issues like crime, national security, abortion, economics, and civil rights, Biden’s history on immigration increasingly looks set to peg him as a man out of time.